When we think of weight loss, rigorous gym exercises, long jogging trails and painful home workouts come to mind. The very thought of all this effort may tempt you to keep the extra pounds you have, rather than try to shed it. However, the simplest of tasks, like walking to lose weight is fruitful when you approach it systematically and consistently. Hear it from the horse's mouth, all I did was go with a structured walking workout for few months, and lost all the pounds I intended to and ended up with a healthier and fit body. Thus I decided to share my experiences and learning about walking as an efficient weight loss method, so you can also enjoy the same benefits. The two most important things you will need for your efforts to be successful in the long run is commitment to the idea and acceptance that results take time. Prepare yourself mentally for both these factors, and you are sure to experience the results of your efforts. With a proper and planned walking routine, you can easily lose one pound per week, without any adverse health effects. Let us look at the other health benefits of walking now. Doctors have forever recommended walking as a great form of exercise. 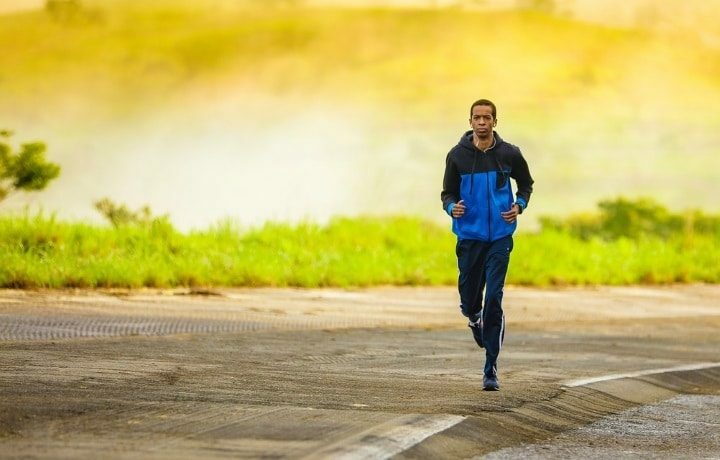 It is a gentle, low-impact exercise that almost anyone can undertake, and is even suggested for people who have underlying medical conditions or are undergoing medical treatment for various conditions. Walking helps improve heart health, and controls cardiac conditions like bad cholesterol and high blood pressure. It exercises the bones and muscles of the body, particularly those in the legs and abdomen area. As a result, it increases blood circulation in this area and tones and firms these muscles. 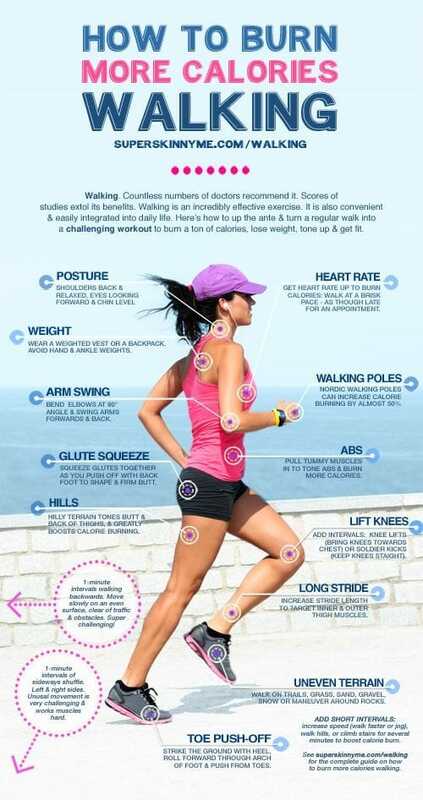 Walking also improves posture. Walking in the outdoors is highly beneficial during early morning and late afternoon, as it exposes us to sunlight and helps us to obtain the Vitamin D we need to stay healthy. Walking is also believed to stimulate the mind and act as an anti-depressant. As with any new exercise regimen, remember that your body will take time to adapt to walking. There may be minor aches and pains associated with it when you first begin. However, it is necessary to persevere, and not let the discomfort weigh you down. These aches will quickly disappear as long as you continue with your efforts regularly. If you have an ongoing medical condition, it is always advisable to check with your doctor before you begin your walking routine. This is also advised if you have a family history of heart disease, are overweight or have conditions like vertigo that can be affected by exercise. Walking is an exercise in its own right, and for the best results you should do it in the right setting and with the aid of the right tools. The footwear you choose is very important, as your feet need to be supported to avoid injury. A pair of shoes designed specifically for walking, and in the right size should be sufficient. While walking, your skin should be able to breathe. So, wear light, loose fitting clothes that allow moisture to pass. Garments made from wicking fabric or cotton are ideally suited for the task. Also dress for the weather. In winter, make sure that you layer up well, so you aren't affected by the cold. Apart from what you wear, you will also have to carry enough water to stay hydrated during your exercise routine. Carry enough fluids like water or electrolyte solutions for the purpose. Also apply sunscreen liberally and wear a wide-brimmed hat whenever you step outdoors for your routine, to protect yourself from the harsh sunlight. More information on what you can use is available here. There are many approaches to making your efforts count and obtain visible results. Choose the one that is best for your situation and stick to it religiously. Although you can alternate between techniques, make sure that your efforts are consistent to actually experience results. Here are the suggested techniques. Use a mobile app like Map My Walk or Breeze to keep track of the number of steps you take every day. Or invest in a pedometer exclusively for this purpose. This will help you note how many steps you take in a day, and compensate if the number falls short. Simply walking isn't sufficient, set your goal high at least 15k steps per day to actually achieve results. It is common logic that you burn more calories when you walk uphill than when you walk on a flat terrain. So, make the most of your workout routine by choosing uphill walking tracks. Also increase the pace of your walk, and you will see that your heart beat increases sooner and that you sweat faster when you attempt this. To make walking uphill easier, simply lean to the front while walking and you will be able to cover more distance in shorter time. If walking continuously for an hour at a stretch is impossible, do it in bits and pieces. 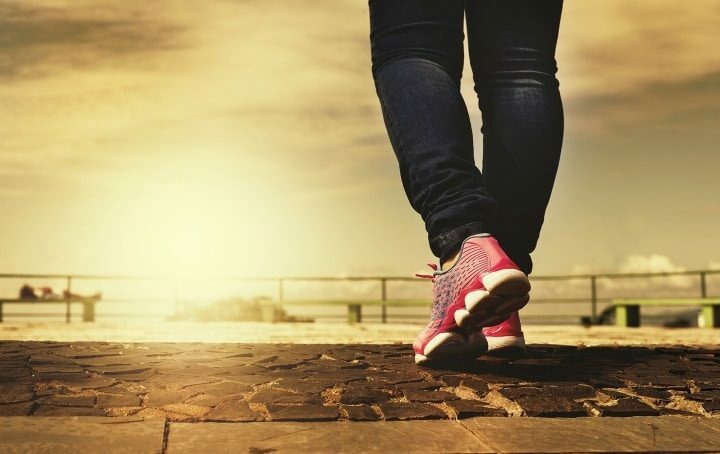 Schedule 20 minutes of brisk walking into your daily routine when you have free time. Simply stretch your meal times by 20 minutes and go walking immediately after your meal to ensure you get the exercise on a regular basis. Walking after meals will keep your sugar levels in check and also keep your body energetic. At regular intervals during your walking spree, increase the pace of your walk. As you speed up pace, simultaneously swing your arms faster. This will help your body burn more calories during the short duration, without tiring you out. As you get used to this, slowly increase the intervals during which you power walk. You will soon be able to cover more distance in lesser time and see the benefits of this action as well. When attempting to lose weight, it is a good idea to control the calories you intake and the types of food you consume. Follow a diet that is rich in protein, but lay off the sweetened and empty calorie laden junk foods. Eat foods that will help you feel fuller, like raw salads and lean meats, without adding too many calories. This will further aid your weight loss efforts. You will be better involved and more energetic when you walk at the right time during the day. Plan your exercise for when you are relaxed and have time to spare. Don't stuff it into a hectic work day, when the tendency is to skip it should the need arise. Make sure you get at least 8 hours of sleep every day, so you are well-rested in the morning. 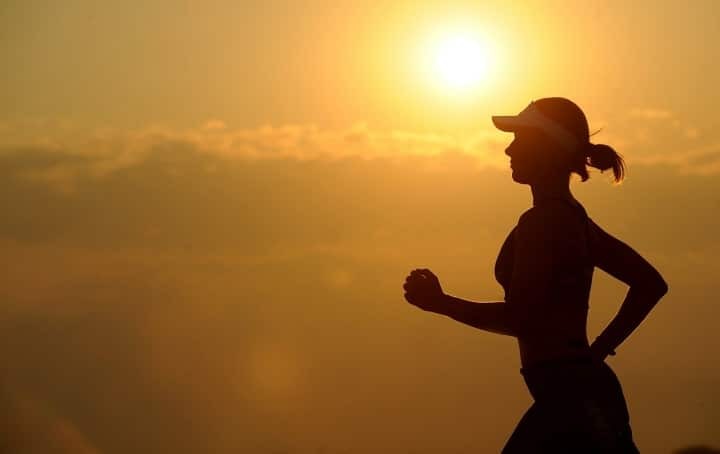 Plan your walking early in the morning or closer to sunset, when the climate will be cool and you will feel relaxed and comfortable in the outdoors. With regular and consistent efforts, as well as using the right approach suited to your situation from the above list, you should begin to see results soon. If you find the approaches above too hard for your liking, I suggest that you start small and slowly build-up. For instance, start with just 5000 steps on the first day. Increase it by 500 steps every subsequent day, so you can slowly reach your target goal. Although the results may take longer, it is always better than not making any effort at all. Once you reach your baseline goal weight, remember to keep up the effort continuously. If you would like to further lose more weight, you can slowly increase the time you walk to the desired extent. Look for extra walking opportunities by parking your car further from the destination, walking to the shops or even using the stairs instead of the lift. We all know that the trouble is only to get started. Once you take that first step, the next one will simply seem to follow. So, I hope you will make that first effort like I did, and experience the results for yourself. If this guide has inspired you and given you all the information you need, please don't forget to hit the share button. Also, do share your thoughts and comments with us. Walking to lose weight is not a Herculean task, as you may have already realized from this guide. I reaped the benefits, and hope you will too.